In my last post, I promised that I will publish my first attempt at a pattern. And so, ladies and gentlemen... today.... for the first time in the (short) history of this blog, I give you.... Mr. Gnome! One day, I was going around my usual business when it hit me: we need a gnome. Because every house needs a gnome, that much is certain. So I sat down and drew one up. To my great surprise, I liked what I had come up with! Before I got cold feet, I hastened to make one out of felt. And now our home is officially gnomed! Mr. Gnome's favourite hangout is a giant pine cone we have in our living room, but he is very inquisitive and is often found in other locations around the apartment. We just can't get enough of his chubby legs! Chances are you need a gnome too. If so, don't be shy and grab the pattern! 1. Cut one of each piece (and two for the hands) out of felt. The back is one solid colour of your choice. Unfortunately I didn't take a picture of Mr. Gnome's back, but I chose a mustard yellow piece of felt for a fun contrast (you can sort of see it a little at the seams). 2. Using the dashed lines to guide you, glue the beard to the body and face first and then overlap with the hat. Glue the hands to the arms and the arms to the body. You can use fabric glue if you have it, but I used regular white Elmer's glue and it holds well enough. Check the completed front against the back to make sure they are the same size. 3. After the glue has dried, you can start embroidering all the fun little details on the gnome's front. Add some beard hair and hat bling, perhaps a belt or cuffs. I added two little felt circles to define his feet in a colour to match the hat. 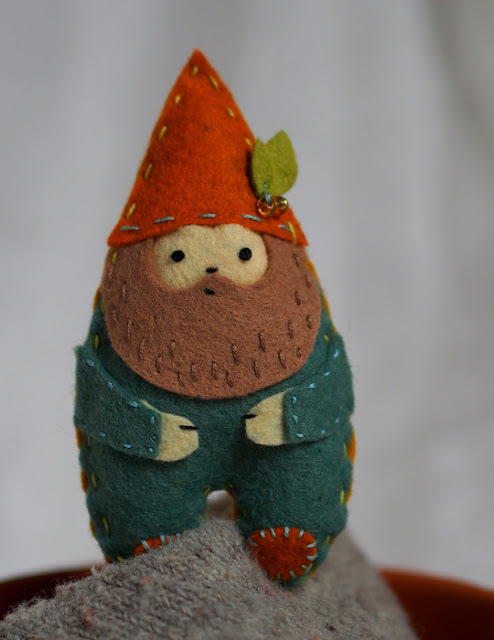 Make two French knots for the eyes, add a nose and a little smile to give you gnome some personality. You're almost there! 4. Starting at the one of the hat's bottom corners (I found that being the best place for me to start, but it's your call), stitch the back and front pieces together. I used a simple running stitch, but you can use a whip stitch or a blanket stitch or any other stitch you fancy. A little before finishing, stuff the gnome, taking care not to over-stuff. He must be plump, but not bulging. Sew up the hole, tie off, hide the thread, and enjoy your new companion! Don't forget to give him a name! Sewing not your thing? You can cut the front pieces out of paper and make a sweet little gnome card! Who wouldn't want one? This being my first pattern, any feedback is appreciated! If you post about a gnome you made following this pattern, I would be delighted to see pictures! And of course, if you have any questions or concerns, don't hesitate to ask me! This pattern is my own creation and is for personal use only. 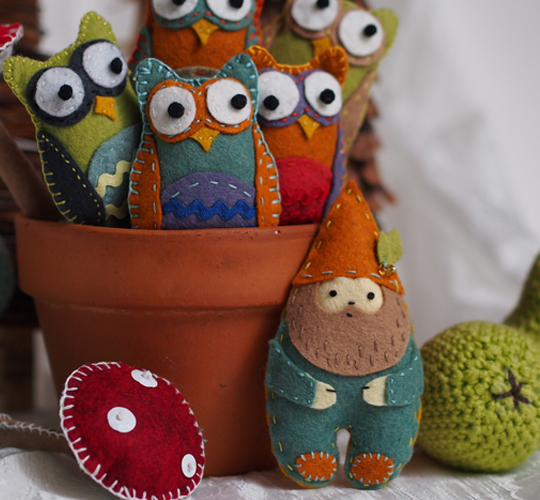 Please do not sell the pattern (as is or modified) or any gnomes made from it. Thank you for your understanding. That's the kind of thing that you see people selling at craft fairs! Do you do that sort of thing? Thank you very much, Bryallen! Thank you, Kait! This is so much fun! Don't do craft fairs unless you have alot of inventory, a price that will actually pay you for ur supplies, time, prep & profit. I made a go of it years ago (still have a ton of product left) and it didn't even end up paying for my supplies. People don't want to pay the price for what it really costs to do fairs. Yes it may be only $15 in material for a $50 item but the time, skill & talent that goes into it makes it a fair price. Sorry this is a pet peeve of mine as I constantly hear "u wld make a fortune @ craft fairs" HA! Not hardly! Try online sales sites w/low cost listing price and doing home shows. Even church fairs are ok if ur booth fee is very cheep. I love ur product though! Awesome, fun & creative! Keep up the good work! It may never make u rich but rich in heart is worth SO much more! Thanks for the wisdom, Kitty! I was guilty of thinking that some items at craft fairs cost way too much. And then, a couple of weeks ago I crocheted a scarf and mentally tried to set a cost on it, including the material and the time it took me to make it... and it really does cost this much! Although I am sometimes happy to pay the price to encourage craftsmen, such purchases are only occasional treats and I know that this is the case with many people. But I'm doing this because I enjoy it and if this free pattern makes someone somewhere happy, then I consider it a success! As a collector of Gnomes, Thank You for the pattern. If you ever go to England, do stop in Devon at The Gnome Reserve. Best garden in England. 2 acres of Gnomes (you need to wear a hat to blend in and not frighten them) and 2 acres of fairies & sprites. Oooh, a gnome collector! The Gnome Reserve sounds like a great place to spend a day at. I definitely hope to do some travelling in England someday. Thank you! HOLA TANIA !!!! ME LLAMO MERCEDES, Y SOY DE CADIZ, ESPAÑA. POR CASUALIDAD, HE CONOCIDO TU BLOG, QUE POR CIERTO ME PARECE ESTUPENDO !!!!! SI ME PERMITES, ME QUEDO AQUI COMO SEGUIDORA, PARA VER TODOS TUS TRABAJOS. YO TAMBIEN TENGO UN BLOG, QUE ESPERO QUE TE GUSTE. ESPERO QUE ESTEMOS EN CONTACTO. SALUDOS DESDE CADIZ. ESPAÑA. Estoy feliz que te gusta mi blog! Me encantaría mucho seguir a tu blog también: me parece que es un lugar lleno de creatividad. Y España está uno des mis países favoritos! Con mi marido hemos vivido en Barcelona durante el verano 2010 y hemos viajado un poco por partes del país. Pero no fuimos a Cadiz, qué lástima! Y ahora tengo alguien con quien practicar mi Español! Qué suerte! This little guy is so cute! Wonderful job on your first pattern. :) I know you don't want anyone selling him, but was wondering if you'd be ok if I made a bunch for a Christmas tree that will be auctioned off to benefit our local children's hospital (Primary Children's in SLC, UT). The theme of the tree is gardening and of course, a garden wouldn't be complete without a gnome! Please let me know, I want to respect your design and work. How clever. Thank you for sharing. My name is Tania. I love crafting, spending time with my family, and getting mail. Glad you are here!